In this article, we highlight the 20 best online schools for accounting master’s degrees in 2016-2017. According to the American Institute of CPAs (certified public accountants), a master’s degree in accounting can provide benefits critical for career advancement. At the very minimum, an accounting master’s may ensure you meet the educational requirements to obtain CPA licensure, since many graduate programs offer the 30 advanced hours of schooling needed once the baccalaureate is obtained. Thankfully, earning a master’s in accounting does not necessarily mean that you have to forego your day job. Flexible online programs are being offered from some of the best online accounting master’s schools in the nation. These programs prepare students for careers as professional and licensed accountants without disrupting life’s obligations, such as childcare or employment. Our ranking is designed to assist you in identifying the best schools offering online master’s degrees in accounting. We examined approximately 100 accredited colleges and universities that offer online master’s in accounting degree programs. From our pool of schools, we looked at the percentage of applicants admitted, graduation rates, student-to-faculty ratios, and graduate tuition/fees (see below for specifics). All data was taken from the most recent published information at the National Center for Education Statistics (NCES) College Navigator. This information helped us develop our list of 20 best online schools for accounting master’s degrees (2016-2017). In the event of a tie, the school with the lowest graduate tuition was awarded a higher ranking. Four specialization areas are offered in Southern New Hampshire University’s online master’s in accounting program. One of the best online schools for accounting master’s is Southern New Hampshire University, which offers four areas of specialization to meet career goals and interests. These concentration areas include auditing, forensic accounting, management accounting, and taxation. Students take a number of core accounting courses online, including cost accounting, federal taxation of individuals, and financial reporting. No GMAT or GRE are required for admission to the program and acceptance decisions are made on a rolling basis throughout the year. Depending on student schedules, an accounting master’s degree at SNHU may be completed in just 15 months. The school is accredited and ranked with major publications like U.S. News and World Report as the #1 most innovative school in the country. New England College is a top online accounting master’s school that requires no residencies. One of the top online accounting master’s schools on our list is New England College. This accredited and top-ranked school offers an online master’s in accounting for busy professionals who want to prepare for the CPA examination while earning an advanced degree. Rolling admission allows students to enter the program every seven weeks, and there is no GRE or GMAT score requirement. The program is 100% online and does not require residencies or campus visits. In fact, classes are delivered via distance-learning technology that allows students to gain 24/7-access to coursework materials. The institution is ranked as a top regional university in the North by U.S. News and World Report. SUNY Polytechnic Institute offers an AACSB-accredited online master’s in accounting degree program. SUNY Polytechnic Institute is one of our top accounting master’s schools online. The program is AACSB-accredited and designed to equip students with the 150-hour licensure requirement for New York State. Also, the program was created to help qualify students for professional accounting examinations leading to CPA and CMA credentials. A total of 33 credit hours in a variety of courses is required. These classes include advanced income tax research, financial statement analysis and reporting, fund accounting, management information systems, management science, and managerial economics. SUNY Polytechnic is a regionally ranked institution that has earned recognition by major publications like U.S. News and World Report. In fact, the school’s online graduate business programs, including accounting, rank #61 out of more than 1,200. Penn State is a top-ranked online master’s in accounting school. One of the best online accounting master’s schools on our list is Pennsylvania State University. With its low student-to-faculty ratio and relatively high graduation rate, Penn State earns a spot among the top online accounting master’s schools for 2016-2017. The AACSB-accredited program is designed for working professionals who want to become a CPA without having earned an undergraduate accounting degree. All courses are delivered online and include accounting information and decision systems, auditing theory and practice, business tax planning theory and practice, financial statement analysis, and strategic cost management. Aside from accreditation, the school has also earned national and regional recognition from major publications. In fact, U.S. News and World Report ranks the institution’s online graduate business programs, including accounting, #7 in the country. UConn’s online graduate accounting program ranks #2 in the country. The University of Connecticut offers one of the most acclaimed accounting master’s schools online in the Northeast. The program is nationally accredited and the first online graduate program to be offered at UConn. Courses are delivered entirely online and designed to prepare students to qualify to meet the 150-hour educational requirement to become a CPA. Students take courses like assurance services, federal income tax, and financial reporting. There is also an option to design your own online accounting program, with eight electives available so that grad students may tailor a degree that suits their interests and career goals. UConn is a nationally ranked university by major publications like Forbes magazine, The Princeton Review, and U.S. News and World Report. In fact, U.S. News ranks the online graduate accounting program #2 in the country. UMASS’ Isenberg School of Management is among the top online schools for accounting master’s programs in the country. University of Massachusetts’ Isenberg School of Management is among the best online schools for accounting master’s degree programs. Ranked by major publications like U.S. News and World Report, the school offers an online master’s in accounting that is designed to prepare students to pass the CPA examination. Courses are delivered entirely online and include financial statement analysis, information technology for accountants, professional responsibility for accountants, and taxes and business decisions. The program satisfies the educational requirement to take the CPA licensing exam. Also, the program ranks as the 68th best online graduate business program in the country among the 1,200 programs surveyed by U.S. News and World Report. Auburn’s online master’s in accounting program mirrors the on-campus program. Auburn University is one of the top online accounting master’s schools in the country. The program is AACSB-accredited and mirrors the same full-time on-campus master of accountancy degree. Online students receive the same information delivered by university professors with years of experience teaching accounting and related disciplines. The online program is also designed to satisfy the 150-hour educational requirement to sit for the CPA licensing exam. Required courses include advanced auditing and assurance services, federal tax research, integrated accounting applications, and research in accounting. Auburn is a top-ranked institution and its graduate business programs have earned recognition from major publications. In fact, the online graduate business programs, including accounting, rank #10 in the country. 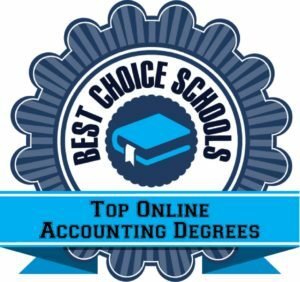 Georgia Southern University is listed as one of our top-ranked accounting master’s schools online. Georgia Southern University’s low tuition and high graduation rate earn it a top spot on our list of the best accounting master’s schools online. The 30-credit hour program earns an online master of accounting that may be completed in two years. In fact, the pace of the program is set up to cater to full-time professionals, so students take just five courses each year (two in the spring, two in the fall, and one in the summer). Online courses include accounting information systems, auditing, current legal issues, financial accounting, fraudulent financial reporting, and tax research. Georgia Southern is a nationally ranked institution, and its online graduate business programs, which include accounting, are ranked #33 in the country by U.S. News and World Report. Southern Utah University’s affordability and low student-to-faculty ratio make it one of the best online schools for accounting master’s degrees. Southern Utah University is one of the best online schools for accounting master’s degree programs due to its affordability, low student-to-faculty ratio, and relatively high graduation rate. Also, the school’s online graduate business programs, including accounting, are ranked #46 out of 1,200 by U.S. News and World Report. The online master’s in accounting degree is designed so that busy and working professionals can satisfy the 150-hour requirement with 30 hours of post-graduate education to sit for the licensing examinations. All classes are delivered online and include: accounting for decision making and control, advanced cost accounting, corporate tax, and practice and theory. Emporia State University is ranked high among our list of best online schools for accounting master’s degrees. Emporia State University is one of the top online accounting master’s schools due to its low graduate tuition rate and relatively high graduation rate. The graduate accountancy program may be completed on-campus or online. Students must maintain an overall 3.0 GPA to graduate. Required courses and electives are delivered to the student online. For those interested in meeting the additional education requirements for professional exams, courses are offered. These include advanced income tax, international economics, law of commerce, managerial economics, and quantitative analysis for business decisions. Emporia State is ranked by major publications like U.S. News and World Report. In fact, the online graduate business programs rank #80 in the country. Syracuse University ranks among the top universities for accounting master’s schools online. Syracuse University is among our top accounting master’s schools online because of its high graduation rate and low admittance rate. The school is selective with admissions and has specific requirements that other less competitive schools don’t have. Classes are delivered online and include corporate financial policy and strategy, financial statement analysis, international accounting and reporting, project management, and taxes and business strategy. The program is also designed to satisfy the educational requirements needed to take the CPA examination in New York and other states. Syracuse ranks with major publications like U.S. News and World Report. In fact, the online graduate business programs, including accounting, rank #73 out of more than 1,200 programs. Rutgers University’s online accounting master’s program prepares students for the CPA licensing exam. Rutgers University is one of the best online accounting master’s schools on our list. The program is 100% online with no GMAT required for admission. The part-time program requires 30 credits for completion and is designed to meet the 150-hour educational requirement for the CPA licensure examination. Also, the program is highly affordable, with in-state tuition extended to all out-of-state residents. Students take classes in accounting for managers, concepts in auditing, design and development of information systems, ethical issues in public financial management, and public sector auditing. Rutgers is a top-ranked institution. In fact, major publications like U.S. News and World Report rank the school’s online graduate business programs, including accounting, #14 in the country. Stetson University offers one of the best accounting master’s degree programs in the country. One of the top online schools for accounting master’s degree programs is Stetson University. This rigorous and high quality program may be completed in just one year and is designed to prepare students to meet the 150 credit hours required for CPA licensure in various states. A flexible online format with coursework that is delivered via distance learning, the program is ideal for busy and working professionals. Online courses include advanced accounting theory, advanced auditing, cases in financial accounting and reporting, contemporary issues and cases in managerial accounting, governmental and not-for-profit accounting, and tax research. Stetson is ranked by major publications like Forbes magazine and U.S. News and World Report. In fact, U.S News ranks the school as the 5th best regional university in the South and 7th best value school. The school’s online graduate business programs rank #29 in the nation. University of Scranton is among the AACSB-accredited top accounting master’s schools online. The University of Scranton is a top accounting master’s schools online that is both AACSB-accredited and affordable. The Kania School of Management offers an online master of accountancy that is designed for working professionals who want to become experts in the field of accounting. The program is aligned with the educational requirements needed to qualify and sit for the CPA licensure exam. Classes are taught entirely online and include accounting communication and ethics, advanced auditing, advanced taxation and regulation, occupational fraud and abuse, and managerial economics. All courses are taught by the same distinguished faculty who teach on the university campus. The University of Scranton follows a Jesuit tradition of nurturing students for success in their careers as well as their personal and public lives. Prep for the CPA exam! Regis University is a top pick for online master’s in accounting degree programs. Regis University is on our list of top online accounting master’s schools due to its low student-to-faculty ratio, high graduation rate, and affordable tuition. The school offers an MS in accounting program that focuses on preparing students with the knowledge needed to meet the 150 credit hour requirements to sit for the CPA exam. The program offers six start dates with courses taught in eight-week terms by the same accounting professors who teach on campus. Online courses include auditing principles and procedures, business or corporate finance, financial and managerial accounting, intermediate accounting, interpreting accounting information, and tax influence on business decision making. Regis is a regionally ranked institution with recognized online programs. In fact, U.S. News and World Report has ranked the online graduate business programs #82 in the country. The University of Michigan ranks high on our list of best online accounting master’s schools. One of the best online accounting master’s schools on our list is the University of Michigan. The MSA program is designed for busy students who are interested in pursuing licensing as a CPA. Students who have already completed an undergraduate degree in accounting may be eligible to have one or two of the required foundation courses waived. Courses are delivered online and include advanced governmental and nonprofit accounting and financial reporting, auditing and assurance services, financial reporting special topics, and individual federal income taxation. The University of Michigan is ranked by major publications like U.S. News and World Report as a best regional university in the Midwest and a top public school. The online MPA (master of professional accountancy) at University of South Dakota is AACSB-accredited. The University of South Dakota lands a spot on our best online accounting master’s schools due to its affordability and high graduation rate. The program is among the less than five percent of the nation’s top business schools accredited by AACSB International. Graduates earn an online Master of Professional Accountancy (MPA) and the knowledge needed to sit for the CPA examination. All courses are delivered online and include advanced accounting theory, contemporary topics in auditing, cost accounting, and tax planning and practice. The university is ranked nationally with major publications like U.S. News and World Report. Also, the school’s graduate business programs rank #41 in the country. University of Miami’s online accounting master’s degree program can be completed in under 20 months! The University of Miami earns a spot on our list of top online accounting master’s schools because of its low student-to-faculty ratio and high selectivity and graduation rate. The AACSB-accredited program prepares students for CPA licensure and provides the advanced accounting skills needed to work in leadership accounting roles. The program is flexible with classes delivered entirely online. Students work at their own pace and are able to graduate in 16-20 months. Online courses include advanced cost accounting, auditing, intermediate accounting, and taxation. The University of Miami is ranked by major publications like U.S. News and World Report as a best national university. Also, the school’s online graduate business programs, including accounting, rank #56 in the country. Liberty University is among our top online accounting master’s schools. Accreditation is essential among the top online accounting master’s schools. In fact, graduate accounting programs lacking accreditation should not be pursued. Liberty University is ACBSP-accredited and offers an affordable online master’s in accounting degree program that is designed for working professionals who require flexibility and conveniently scheduled courses. All classes are delivered online and include accounting ethics, advanced business law, advanced cost accounting, advanced financial accounting theory, organizational behavior, and tax research and jurisprudence. Liberty University is a regionally ranked institution with recognized online programs. In fact, U.S. News and World Report ranks the school’s graduate online business programs #75 in the nation. UNC is our #1 pick for online schools for accounting master’s degree programs! University of North Carolina is our top pick for online schools for accounting master’s degree programs. In fact, UNC has one of the nation’s top business schools in the country – the Kenan-Flagler Business School. The school is highly selective, affordable, and offers a low student-to-faculty ratio. UNC’s online master’s in accounting is designed for working professionals who want a fast-paced yet convenient graduate program. The program may be completed in just one year and serves as preparation for professional licensing examinations like the CPA. Students interested in tax or auditing may choose this concentration, which offers a more comprehensive examination of these areas of interest. UNC earns the top spot for our best online accounting master’s schools. This concludes our ranking of the 20 best online schools for accounting master’s degrees in 2016-2017.